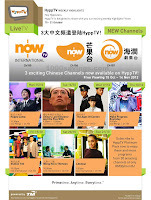 Enjoy these 3 new exciting Chinese channels ~ now International (Ch 155), now Mango (Ch 156) & now Hairun (Ch 157) ~ with free viewing from 15 October till 14 November 2012. 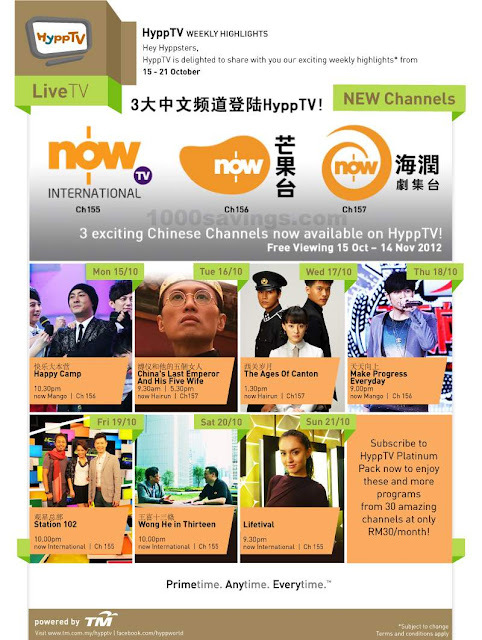 The Best contemporary Cantonese HD channel now available exclusively on HyppTV, teeming with travelogues, lifestyle chic, modern cooking shows and entertainment news covering hot topics from Hong Kong, China, Taiwan and the Asian region! Curated by distinguished celebrities and populated by eminent artists, now International Channel provides you with a new level of Chinese entertainment experience that you have never had! now Mango presents popular variety shows featuring celebrities from China, Hong Kong, Taiwan Korea and Japan! Exciting programs include game shows where celebrities wholeheartedly participate in live, humorous standoff contests; and talk shows where artists expose their deepest secrets to our hosts and share their touching stories behind their fame and achievements – a must watch for all fans! Malaysia’s First Stop for China’s Acclaimed Dramas, now Hairun presents critically acclaimed and award-winning drama series created by China’s largest private TV drama production house. Star-studded drama series, together with in-depth showcases hosted by celebrities, appeal to all Chinese drama lovers in Malaysia! The exciting world of HyppTV is where you can enjoy a variety of movies, serial TV, documentaries, news, entertainment and much, much more - all on demand, all at your convenience. No more fixed schedules and time-tables to worry about. HyppTV is delivered via UniFi's high-speed broadband network. HyppTV will revolutionize the way you, and your family, enjoy TV! Primetime. Anytime. Everytime. Would like to subscribe for parents, may I know how much per month for these three channels above?